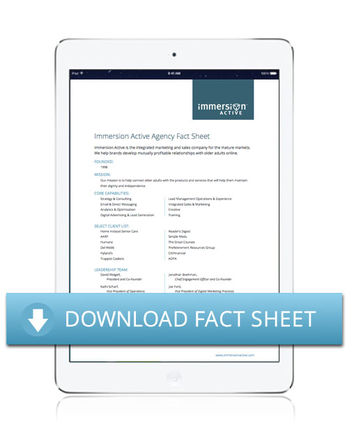 Since 1998, Immersion Active has evolved from a boutique web shop to the leading digital marketing firm solely focused on selling to boomers and seniors. Located in Frederick, Maryland and providing services across North America, Immersion Active has been the recipient of over 130 awards and, more importantly, generated over $1.5 billion dollars in revenue for the clients we serve in the 50+ marketplace. Underlying all that we do is a desire to have a positive and quantifiable impact on the world through our work. Nestled along the foothills of one of America’s most livable communities, our founders strive to create a fully human workplace. Trust, respect, and not taking ourselves too seriously are some of the values that shape what it means to work with us. Our team loves working within the 50+ marketplace and bringing value to the boomers and seniors population.